For as long as games have existed, developers have faced a dilemma – how do you create an accessible experience without sacrificing what makes your game compelling and challenging? Few games have found the perfect balance. Enter Polish developer Thing Trunk and its new Return 2 Games line, which aims to temp lapsed gamers back to the hobby with more approachable versions of big 90s hits. 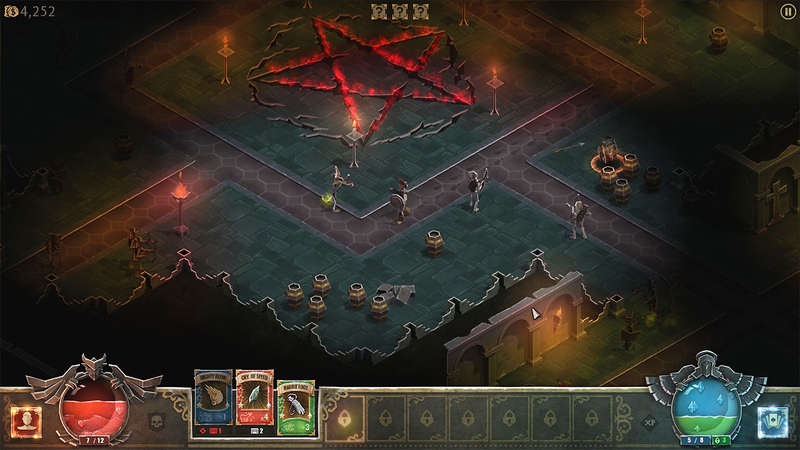 The first title in the series is Book of Demons, a take on the classic Diablo formula featuring streamlined controls, mechanics and the ability to customize the length of your play sessions. So, does Book of Demons nail that sweet spot between accessibility and substance? Does it present a viable alternative to the current spate of less-than-friendly dungeon crawlers like Dark Souls and Path of Exile? Or does this trip to Hell not delve deep enough? Book of Demons tells a familiar story – a once-prosperous town (we never learn its name, if it even has one) has fallen on hard times due to a nasty hellspawn infestation. It’s up to you enter the cathedral, battle down to the deepest level of Hades, and kill the nefarious Archdemon. Sure, easy peasy! Despite its simplicity, Book of Demons’ tale has its charm. The town’s four remaining residents (the Healer, Barmaid, Sage, and Fortuneteller) are well-voiced, and drop amusing little nuggets of lore to keep the player engaged. 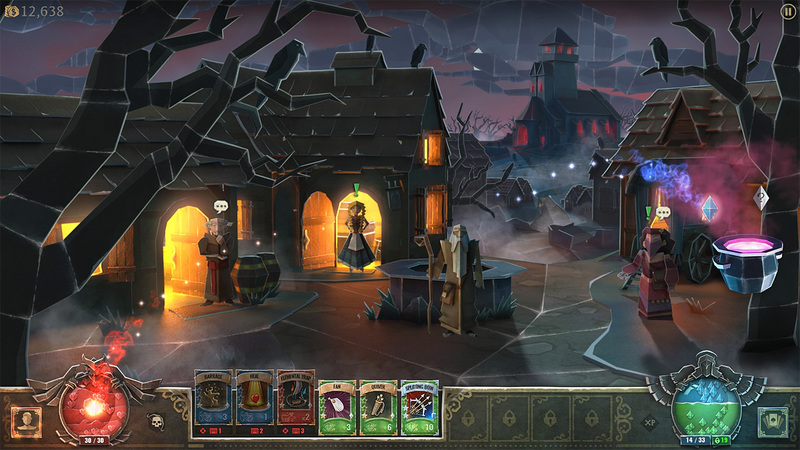 Book of Demons’ whimsical papercraft visuals also have their appeal. It’s fairly obvious Thing Trunk had a limited budget to work with — your avatar and enemies bop around like miniature toys being moved by an unseen hand rather than being fully animated – but the game’s sense of style largely makes up for its shortcomings. Interestingly, even though the game appears to be 3D, Book of Demons is actually built using good old-fashioned 2D backgrounds and sprites. This isn’t just a gimmick – it results in a game that could comfortably run at 60fps on a potato. Book of Demons includes three playable classes – the standard-issue Warrior, long-range bow-wielding Rogue, and magic-dispensing Mage. Regardless of who you’re playing as, controls are simple. Exploration is restricted to narrow, branching paths, and pretty much everything important – movement, attacking, opening chests, smashing pots – is done with a click of the left mouse button. Various features have also been implemented to alleviate typical dungeon crawl frustrations. You leave footprints behind as you explore, making it easy to see where you’ve been and backtrack to the level entrance if need be, and a checklist of important items is provided, so you’ll never leave anything behind (unless you want to). Equipment and inventory management is handled via cards, which are found in the dungeon. 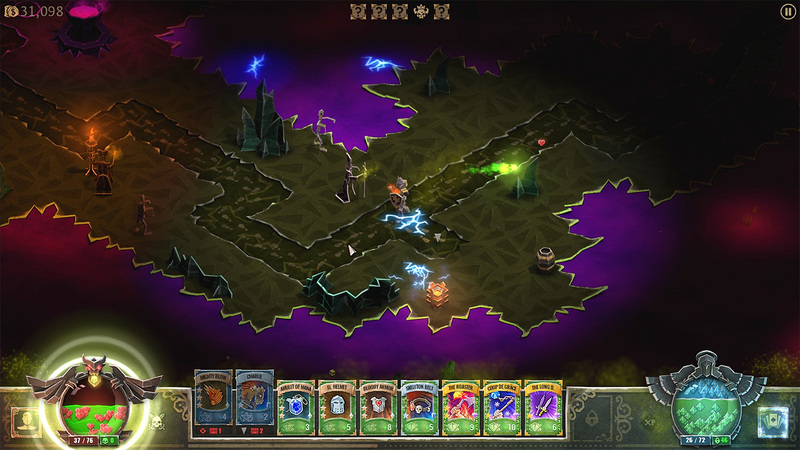 There are three types of cards – items, which are limited in use, but can be recharged in town, spells, which consume mana and have to be manually activated by the player, and artifacts that bestow various passive effects. There are only 40 unique cards per class, but they all come in magical and legendary variants and can be upgraded up to three times. If this all sounds a bit rudimentary, well, it is, and yet hacking your way through Book of Demons’ procedurally-generated underworld is still surprisingly addictive. Collecting cards and loot is satisfying on a fundamental level, and the game keeps its levels lively with steady flow of new enemy types. You’ll encounter everything from gargoyles, to goatmen, to giant spiders, which may have shields, elemental powers, guardian minions, or other unique abilities/defenses. The game also throws a large number of wackily-named bosses at you, each of which has multiple sometimes-tricky phases. Combat is pretty simple at first, but once you reach Hell proper, it gets downright frantic. Book of Demons manages to wring a surprising amount of depth and variety out of its seemingly-basic “click it until it dies” system. Book of Demons’ accessibility doesn’t just come from its streamlined combat and exploration – it also really respects players’ time. 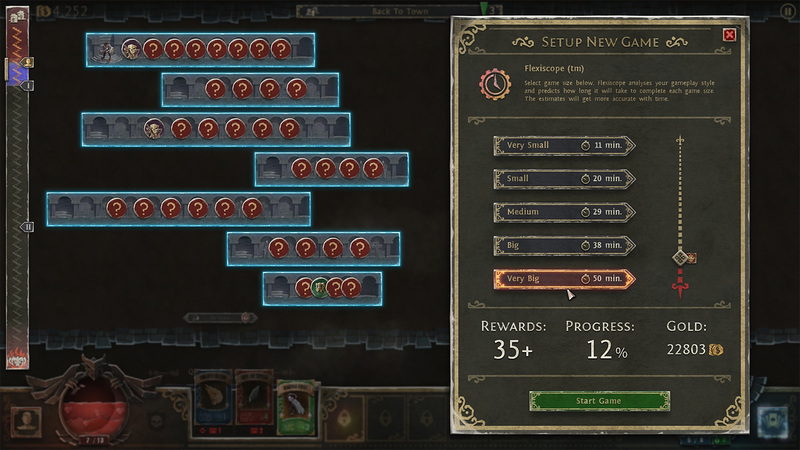 The game’s unique Flexiscope system lets you set how long you want to play, then creates a satisfying mix of challenges and rewards to fit into that time limit. Personally, even when I had more time to play, I preferred to tackle multiple “small” play sessions, which provided perfect poppable bites of adventure, but it’s up to you. Reaching the deepest depths of Hell for the first time will take around 10 hours, but doing so will unlock Freeplay, which includes punishing new difficulty levels. You can also tackle the game with a different class or try to stake out a spot on the online leaderboards. Sure, the game may become repetitive with time, but it’s really the perfect “earbuds in, music up” chill-out experience. Those just looking for a good zone-out game could end up giving their mouse-clicking finger quite a workout. This review was based on a PC copy of Book of Demons provided by publisher Thing Trunk. You can purchase the game with a 20% discount via Fanatical. Book of Demons is rather brilliant in its own small way. It strips the Diablo formula to its bare essentials without sacrificing any of its appeal. In some ways, it even improves on Blizzard’s series. If you’re a busy adult pining for your 90s gaming heyday, Book of Demons is a must play, but really, everyone ought to give it a shot. 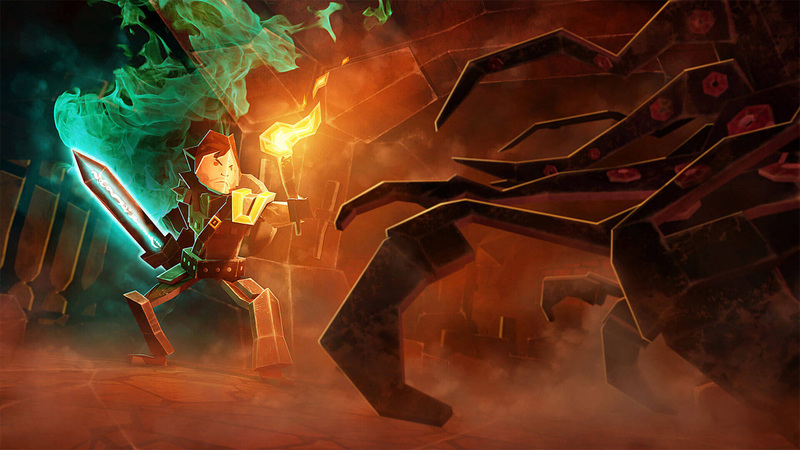 This deceptively addictive dungeon crawl is worth getting fired up about.